Bilstein B6 4600 (Air) shock absorbers and suspension air springs are an upgrade to the original air suspension systems on many European brand vehicles. Bilstein B6 4600 (Air) shock absorbers and suspension air springs are designed to connect directly into the original plugs on the vehicle, ensuring modification-free installation and provide better handling and comfort. 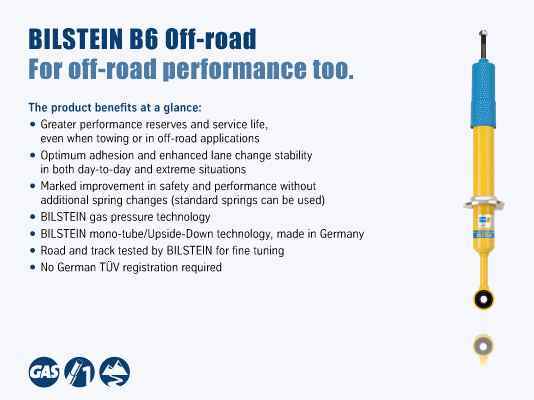 Bilstein B6 4600 series are designed specifically to help your stock height truck, van or SUV reach its pinnacle in ride performance and handling, while still providing the comfortable ride that has come to be expected from the name Bilstein. 2005-2009 Land Rover LR3 Bilstein 4600 Series Strut and Shock Absorbers, The Bilstein 4600 Series Strut and Shock Absorbers is designed specifically to fit your 2005-2009 Land Rover LR3 without any modification to your beloved Land Rover LR3. Bilstein 4600 Series Strut and Shock Absorbers will also fit 2010-2016 Land Rover LR4. If this Bilstein 4600 Series Strut and Shock Absorbers is not exactly what you are looking for to accessories your , please don't give up just yet. Our catalog has huge variety of parts and accessories for your .